Amy Schumer, a comedian, has depicted the unexpected turn your career takes when you become the victim of sexual assault in the military. We are not only harmed by the perpetrator but we are again harmed by the system. And currently we have two proposals in Congress that begin to address the issue. One is the Stop Act sponsored by Representative Jackie Speier. The other is the Military Justice Improvement Act sponsored by Senator Kirsten Gillibrand. Please watch the Amy Schumer video here before reading further. If you keep up with Congressional efforts to address sexual assault in the military, you will find that the media discusses Senator Gillibrand’s Military Justice Improvement Act the most. But what most people do not know is that the MJIA was a compromise to our original efforts. I supported any efforts made by the Senate at the time considering we did not get the support we needed for the Stop Act from either the House of Representatives or military and women organizations. At the time, it was better then nothing and at least Senator Gillibrand addressed an option for our military members who do not report due to fear of retaliation from their Chain of Command. But it is only one element of the big picture. The Stop Act was introduced by Representative Speier as early as 2010. When Congress learned that victim’s had to remain on station with their alleged perpetrators because there was nothing in place to address this, they proposed the Defense STRONG Act. The STRONG Act also came out about the time the Invisible War movie (www.invisiblewarmovie.com) began screening in theaters across the country. The STRONG Act’s most valuable piece of legislation was the expedited transfer, which gave Commanders an avenue to address transferring members who had been sexually assaulted or harmed by someone in their Chain of Command or local area. The Defense STRONG Act trumped the Stop Act in the media but it too only dealt with an element of the problem. The Stop Act was introduced initially by Speier as a way that we could tackle the problem on a whole. It was obvious that Representative Speier had put some thought into this piece of legislation. It dealt with removing Commanders from the investigation and prosecution of sexual assault because either members did not trust their Chain of Command or were afraid of retaliation. The reasons are legitimate. All is takes is one person in that Chain of Command to make one victim blaming comment and it can shut the entire reporting process down. All is takes is a member to witness how military leadership has handled sexual assault cases in the past to shut the reporting process down once again. There is a reason that 87% of our members do not report the crimes perpetrated against them. They fear retaliation and loss of career because they have seen it done to others. The Stop Act called for both civilian and military professionals to work as a team to address the sexual assault complaints in a non-biased way. The Stop Act focused on the complaint, the investigation, the prosecution, the treatment, and the impact on society as a whole. It only makes sense to work with civilian authorities given local communities are not immune to the dangerousness of violent criminals. The civilian aspect would also help prevent undue command influence because no one should be sweeping these crimes under the rug in an attempt to protect their career or that of their comrades. And if it was found that any military leader attempted to hinder investigations in any way, then they would be held accountable for that because civilians are there to safeguard the process. The MJIA when first introduced mirrored elements of the Stop Act but after stripped in the congressional bill making process eventually focused primarily on who victims of sexual assault should report to. Removing military leaders and Commanders from the reporting, investigation and prosecution of violent crimes was the point of contention. The military feels that Commanders should retain control and ownership of those decisions and Gillibrand offered the MJIA as a compromise to our original request. But the MJIA does not go far enough. Military members do not report to Chain of Command due to fear of retaliation. So who should they report to? Gillibrand suggested reporting to military prosecutors instead. The MJIA is addressing one element of the entire system, a system that a lot of members feel is broken and riddled with undue command influence, a system that no longer protects either the accused or victim’s constitutional rights. As evidenced in the case of General James Amos, Commandant, USMC, an officer’s proactive stance against military sexual assault can get cases thrown out in the end because of undue command influence. The argument is that military members may feel compelled to pursue prosecution and/or prosecute despite a lack of evidence because the senior leader’s stance against sexual assault can be considered a direct order. I initially supported the MJIA because it was better then nothing. Much like the survivors, Representative Speier was shut down as well. She did not get the support needed from veteran’s organizations who work closely with Congress on behalf of military members. The one organization we initially turned to shut us down as well. We were thankful that Protect Our Defenders was created to not only support Representative Speier and the Stop Act but also support any and all legislation that would help our military members find justice for crimes perpetrated against them. Protect Our Defenders has been a supporter of the Stop Act since they were created and for that we are very appreciative. The MJIA was a compromise. I supported it in last year’s congressional session. But now that we are in a new session, its time to renew our commitment to a piece of legislation that was not a compromise (or maybe even a distraction). Reporting a crime to a prosecutor as opposed to your military Commander is not the priority. Our members have reported not trusting the Chain of Command, not trusting the military justice system, fear of retaliation from military leaders, and quite frankly hardly anyone, especially Officers and leadership are held accountable. Therefore, I am not going to beg for the MJIA when it barely scratches at the surface. We are in a new session and it’s time to fight for what we always wanted. The Stop Act offers the solution that we have been fighting for. In the end, we are asking for the same rights as American citizens while in garrison. We should have the right to report a violent crime to the cops like every body else does. We should be referred to a sexual assault examiner and for treatment right away. 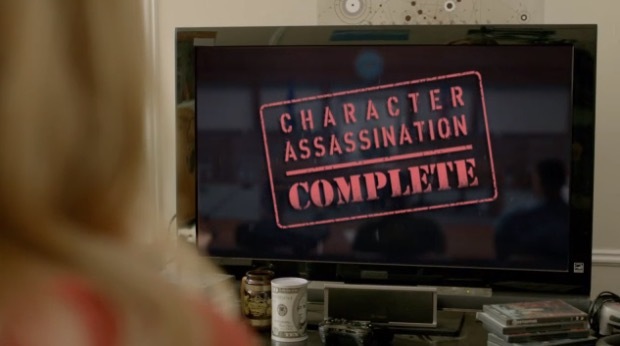 We should be given the knowledge and understanding necessary to make a decision as to whether or not we want to move forward with a case (unlike the way it currently is, as depicted in the Amy Schumer video), we should be working with civilian professionals so that we can track these violent criminals and prevent crimes from being perpetrated against both our military members and the civilians who live near our military bases. This is only how we are going to deal with sexual assaults and violent crimes in the US. We haven’t even talked about how we are going to deal with them overseas. To be continued. These are the numbers for 2009-10. We are now up to an estimated 26,300 sexual assaults per year yet only 3,374 reports by military members. The DoD tells us there has been a 50% increase in reporting. This may be attributed to both an increase in crimes and reporting. We are still left with a broken justice system that prosecutes far less complaints than they receive. 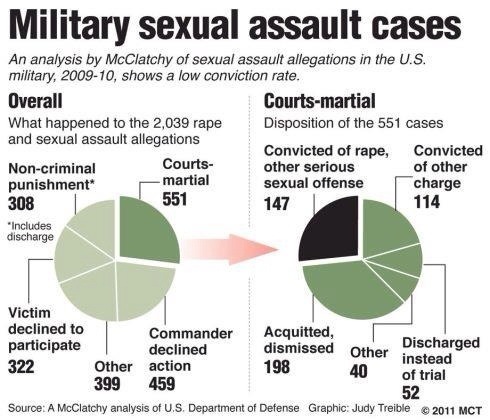 The civilian prosecution rate for sexual assault is about 40% whereas the military prosecution rate is less then 10%. This entry was posted in Jennifer Norris, Military Policy and tagged Department of Defense, Jackie Speier, Justice, Military, Military Justice, Military Justice Improvement Act, MJIA, Sexual Assault, The Stop Act by Jennifer Norris. Bookmark the permalink.